Once upon a time I thought making my own tofu was impossible. Of course, once upon a time I'd eat a can of chickpeas for dinner and call it a day. Times have changed! Though I still love chickpeas. It started with Hodo Soy. Delicious, fresh, non-GMO, medium textured Hodo Soy. Aseptic packaged tofu from the grocery store paled in comparison; my omnivorous sweetheart turned out to like fresh tofu, so I knew we could never go back. When the Hodo Soy stand left our usual farmers market, I tracked it down at another, then another. Then it left the East Bay farmers markets completely! I hunted it down, packaged, at Berkeley Bowl West, then at Whole Foods. One day, the medium tofu was inexplicably gone forever. I started hoarding the firm tofu. What were we to do? "You'll have to start making tofu," my omnivorous sweetheart said. I bought Andrea Nguyen's Asian Tofu. It started to seem possible. Then she put together a tiny kit for purchase. It started to seem impossible not to. Her instructions are clear and her troubleshooting tips super helpful. I won't reprint the recipe here, but I really do recommend picking up either Asian Tofu or the smaller e-book. I do have some notes for first time tofu makers! Be sure to use a large enough pot when cooking the initial soymilk. It foams! It rises! It really, really does. I had to stop halfway through the first simmer and pour it out into a larger pot. Dangerous! Even if you think it's silly to use that giant soup stockpot, do it. 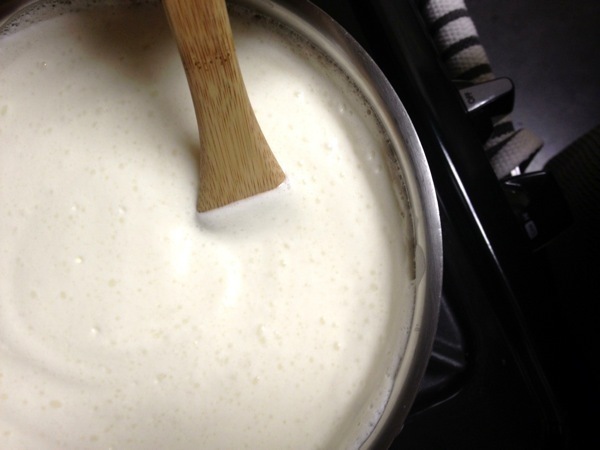 Save the pulp that results from straining the soymilk. This is okara, a food in itself, high in protein and fiber. Traditionally it can be simmered in broth or sautéed with vegetables; it can also be added to baked goods or hot cereals. I made a scramble with some of my first batch and it was incredibly - almost alarmingly! - eggy in texture. If you, like me, stock up on cartons of pumpkin purée during the autumn months, surprise! A one pound carton fits perfectly into the top of some particular tofu molds. You can also use a colander instead of a specialized mold if you don't mind having a non-rectangular block. Be very careful when moving your brand new block of tofu from the press to your partially water-filled storage container. New tofu is delicate! Be equally careful when topping off the water to completely cover the block, use low pressure. 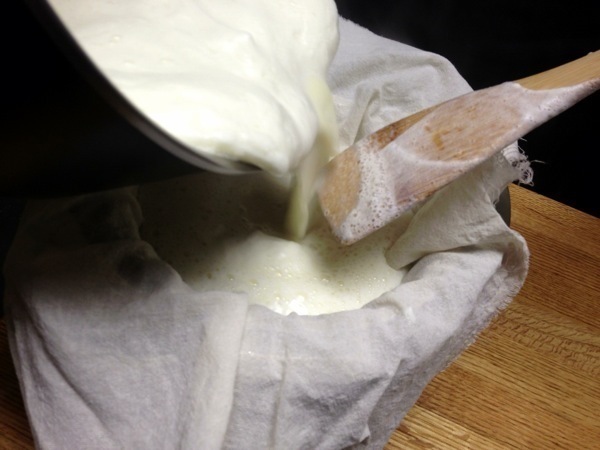 Clean up quickly - soymilk and tofu both are very, very sticky. Feel like a wizard! You just made tofu!